You are actually confirming everything that Gareth states in his article about deniers. Did you actually read this sentence? For many years sceptics enjoyed pointing out that 1998 was the hottest year on record – claiming there was a ‘hiatus in warming’ – until 2014 racked up record temperatures. The fact is that both record years are irrelevant; it is the long-term trend that matters. Have you told the IPCC there’s no hiatus? Point of fact: I didn’t mention 1998, but “about 1995”. The trends of low or absent warming in different datasets do not begin in 1998. Considering 2014’s temperature was a “record” by an infinitesimal amount, it did not indicate statistically significant warming and did not end the hiatus. The long-term trend is very important for determining a trend; but this is simply a hiatus. That means that the temperature fails to rise by however long it fails to rise, nothing more. You are confusing variation with trend. There is insufficient statistical evidence for a hiatus. The reasons behind natural variation are many and varied but the long-term trend is undeniable. The next year or two will be very interesting given the sudden sharp swing to El Nino conditions. Thanks, Andy. There are better treatments elsewhere, too, if Simon might be interested. You are confusing variation with trend. using the SkS Trend Calculator, how so? I don’t recall sceptics “enjoying” anything of the sort, let alone “pointing it out”. The hiatus in warming is determined statistically (see McKitrick 2014 below) by starting at the present and working back in time to ascertain the length of flat trend, the addition of new present data simply extends the hiatus in whatever temperature dataset is being analyzed. The 2014 “record” was a couple of hundreths of a degree in GISTEMP but no such record in HadCRUT4 or the satellite sets UAH or RSS. McKitrick, R. (2014) HAC-Robust Measurement of the Duration of a Trendless Subsample in a Global Climate Time Series. Open Journal of Statistics, 4, 527-535. doi: 10.4236/ojs.2014.47050. What is your assessment of the “long-term” “undeniable” trend in this dataset Simon? And why exactly did the current positive phase (upswing) start around 1700? 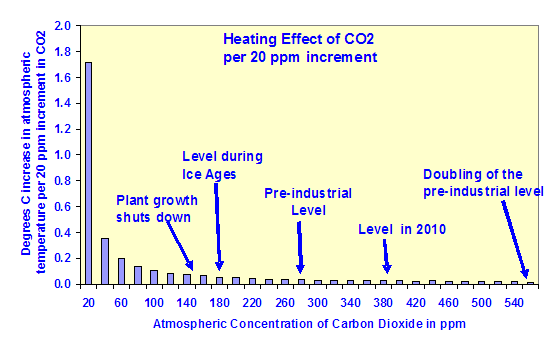 No CO2 uptick late 1600s so no attribution possible there. Sorry, this was addressed to Simon, as you may have figured out by now. But under the current approach, methane gets treated like it has a similar impact as carbon dioxide, lingering on in the atmosphere interminably – it doesn’t. The currently accepted methodology for measuring methane in terms of carbon dioxide “equivalents” puts the potency of methane at 25 times that of carbon dioxide, but there has been quite a bit of research done to suggest that grossly overstates the long term damage methane does, given its decay rate. Pressing this point home could be a major win for New Zealand, and take the heat off our farmers whose main way to reduce methane at the moment is to shoot their stock. Haven’t we been saying this all along? Has your research uncovered anything about the strength of current El Nino phase? My impression is that it’s very mild and could fizzle out, but Simon seems optimistic there’ll be strong warming. Yes, I saw it come through but was busy. I’m amazed at the turnaround. I’ll try to read the post soon. Must do something about dinner that doesn’t include burning anything. No I don’t know. I don’t think anyone knows until it plays out. That’s one of several possibilities but again we’ll have to wait and see. Weak or strong doesn’t necessarily mean a weak or strong temperature response is guaranteed. <"but Simon seems optimistic there'll be strong warming." Well he would wouldn't he?. But his mindset is conditioned by the temperature datasets that are at "record" highs. Those datasets are NOT sensitive to ENSO. 1998 doesn't stand out in GISTEMP. Prof Bob Carter in 2006 was the first sceptic I’m aware of to “point out” the trendless temperatures. He certainly wasn’t “pointing out that 1998 was the hottest year on record – claiming there was a ‘hiatus in warming”, contrary to Morgan’s misrepresentation of sceptics. The ward “hiatus” evolved along with “pause” (Hansen, Sato, and Ruedy), “standstill”, “stasis”, etc. The IPCC seems to have settled on “hiatus” in AR5 – their latest assessment, so sceptics are just using IPCC terminology. Just over four years ago, early 2011, a decadal global temperature bet was made. That the decade beginning Jan 2011 would be significantly warmer than the decade beginning Jan 2001. Based on the average of RSS and UAH. In January 2015 I did an update as to how that bet was turning out. Look at the graph. 2014 is nothing special. Nice, Robin. Thanks for the update. Goodness me, Simon is not easy to have a discussion with, is he? It must be kept in mind, when one is discussing the hiatus with those who call we followers of the scientific method and demand evidence of anything before we accept an unproven proposition ‘Deniers’, that warming, even if the most determined search fails to find any statistically-significant warming at all, is the Big Evil that the world must strive to eradicate. Cold is the real danger. as anyone who has read history can verify. Cold stops any form of seasonal growth in cereal crops, crops which become stock foods and foods for humans, therefore removing the basis upon which all of modern agriculture is built: one only has to read various accounts of the rise and fall of various cultures around the world to understand that humanity thrives in warmth and does not thrive at all when the world cools. To read the accounts of ordinary village life in the UK during the LIA is to understand the misery and death that extreme cold brings. Only lunatics would pursue a lack of warming as their goal. Given the remarks by Gareth Morgan regarding agricultural methane and Prof Frame’s similar views (I wonder if they are somehow connected??? ), leads me to think our farming friends should use this to their advantage and get agriculture out of the ETS and climate talks for good. Climate scientists have constructed models to predict what Earth’s climate will look like decades, even hundreds of years in the future. Unfortunately, many major components of Earth’s climate system have not been accurately monitored for very long. This makes such predictions suspect if not laughable. A case in point are variations in ocean circulation and temperature. In the Atlantic there is a cycle for sea surface temperatures variation called the Atlantic Multidecadal Oscillation (AMO). The AMO is linked with decadal scale climate fluctuations like European summer precipitation, rainfall in Europe and India, Atlantic hurricanes and variations in global temperatures. A new study in the journal Nature reports that the AMO is again transitioning to a negative phase, meaning the vaunted “pause” in global warming may be with us for decades. In fact, scientists at the University of Southampton predict that cooling in the Atlantic Ocean could cool global temperatures a half a degree Celsius. That’s the amount of warming in the IPCC’s 1951 – 2010 anthro attribution period (see AR5 SPM Figure 1). No, we’ll forgive you. Eventually. Yes the video is “amusing’ for the sound effects. Less amusing for the fact that they are now saying the same things about methane that we have been banging on about on this blog for quite some time now. That is the problem with not listening to other people’s views. Yes, I suppose the question is why have “they” changed their minds? Has the truth influenced them or have they been captured by the fossil fuel climate misdirectionists? I seem to remember that Dr Frame conversed briefly on this blog when he arrived back in Wellington (a couple of years ago?) and talked about correcting the GWP of methane. Yes, I think so. It’s not just the GWP either, it is the fact that ruminant methane gets recycled through the natural carbon cycle. The fact that the methane was a product of the CO2 and water in the first place seemed to elude this person. No matter how many times you repeat these facts, no one seems to get it. At the risk of throwing myself in front of your speeding truck, I confess I wouldn’t have known that, either. Is that, chemically, the only way to produce methane? Is it done at high temperatures? I’m aware it may be an abiogenic source in the mantle and it’s certainly plentiful on other planets. (2) Cows then eat the grass. (3) Cows belch methane, which is a product of the digestion of the grass. If there are other inputs such as fertilizer, then the parameters change, of course. Now I feel silly. Thanks (not for making me feel silly but for patient explanation). I didn’t know the details of the breakdown in step 4. Of course methane is not always formed at high temperature, as cows’ tummies are nothing like the hotness of lava. I wasn’t thinking. Not about this; I’ve just sent off a quotation to edit another PhD thesis (not in chemistry) and should have left more of a pause before turning to chemistry. I’m going out to find lunch. Enjoy your lunch and may your flatulence be guilt free. You have just reminded me of the very good reason not to get excited about the supposedly excessive farting of animals on grassland farms. There is always so much wrong about their silly ideas that it is hard to keep all these facts with which to shoot down said silly ideas in one’s mind at all times. Cross-fertilisation of trains of thought can be hilarious, but one must first be equipped with a sense of humour. What say you Gareth Morgan? No response forthcoming from Gareth Morgan. I would have thought this was easy pickings if the “weight of evidence” could be referenced. Apparently it’s a futile quest. Simon Papp’s comment upthread regarding an impending El Nino (“The next year or two will be very interesting given the sudden sharp swing to El Nino conditions”) is on shaky ground imo. For 18 months NIWA and Metservice have been hyping the possibility – nay, the high-confidence probability – of a strong El Nino any minute soon. For the past 18 months global and local climate scientists have been calling for a “High” chance of El Nino forming, many saying it would be as brutal as the one in the 1990s that caused major droughts in New Zealand. Despite the alarming prediction last summer passed us by with no El Nino. After 18 months in the media the term “El Nino” has almost developed it’s own persona. It sounds like the Jesse James of the weather world. My issue isn’t with the climate scientists thinking El Nino is coming – my issue is with the messaaging that comes with it – the high confidence it will happen…and then 18 months go by and it’s brushed off as ‘it’s still coming’. Well, we’ve had concerned farmers contacting us for 18 months – some in absolute fear about what El Nino might do to their farm. We strongly feel at WeatherWatch.co.nz that all this talk is doing little good. The article continues and the comments and answers are very interesting – particularly regards the aggressively commercial nature of NIWA. Is this the way the backdown plays out? The endless warming becomes cooling, and man-made change becomes natural cycles one paper at a time? The press releases still talk of “change”! No mention that natural cycles could have been the cause of past warming, and that skeptics have been saying this for years. The press release is below for this tricky paper [also linked upthread] that doesn’t follow the IPCC plan. In the world of climate news it’s important that the headlines include the words “climate”, “global” and “change” and not the words “cooling”, “natural cycles” or “skeptics might be right”. Yes, “tricky” paper for the CO2 obsessed. Have to say it’s very refreshing not being censored at Gareth Morgan’s World (as opposed to Gareth Renowden’s World). Yes it is refreshing to not get censored. One gets used to fascistic rhetoric like “Denialists that have been marginalised” in our modern tolerant “inclusive” world, I suppose. A natural phenomena. Temperatures have been rising since the 1600s, an uptick around 1700 but no CO2 uptick therefore no CO2 attribution. Same in the 20th century (see IPCC SPM Fig 1), temperatures rising at the same rate early century (1910 – 1940) as late century (1970 – 2000) but no CO2 uptick until 1950s. The only temperature rise that the IPCC attributes to GHGs on a decadal basis is the 1980s and 1990s (see AR5 SPM and SPM Fig 1). This century, temperatures are NOT rising. Certainly not rising at a rate to validate the CO2-forced models. Again, a natural phenomena (the default rate). AGW demands a boost (acceleration) in SLR but that boost is not evident in global or regional SL metrics either satellite or tide guage. Case in point: Wellington Harbour tide guage data. Tonkin & Taylor, in their report to the WCC, explicitly state that they did not ascertain the historical rate of rise. They could have gone to NOAA’s Tides and Currents SL map of tide guages and clicked on Wellington, but no, Or they could have downloaded the PSMSL data and plotted it themselves (not hard, see below), but no. Consequently T&T do not plot IPCC prediction vs observations as any responsible and credible analysis would do. Dr Jan Wright, MfE Commissioner for the environment, in her 2014 sea level report was simply incompetent (many issues arising). For such an inept report from someone on $300,000 p.a. and MfE resources, she should be sacked. 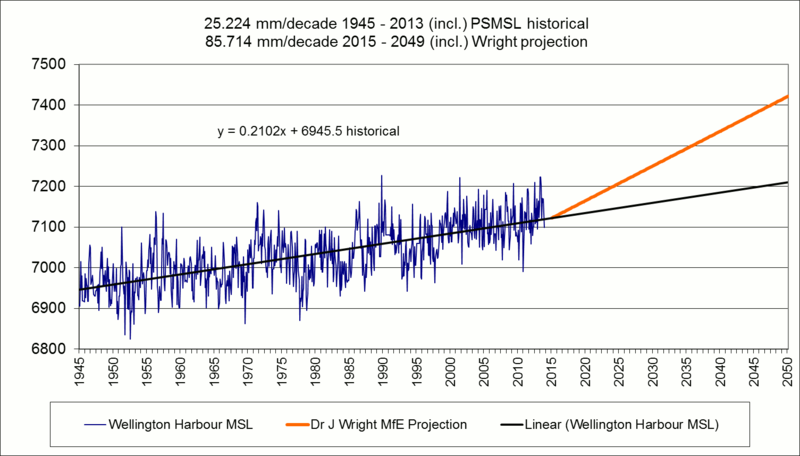 Obviously the prediction start point inferred from Wright’s report is incorrect bu even if the 30 cm rise prediction started from 1990 it is clear that the SLR accleration prescribed by AGW and the IPCC is just not happening. Nice one Andy. Sock it to ’em! NE USA up to NW Canada and Alaska (a little above trendless) completely different to SW USA (warming). China and Japan only a little above trendless. Radical warming Australia, Eastern Europe, NE Canada, Africa, Sth America. Arctic. Vast areas of ocean trendless. The convocation of clowns on the left screeched with one semi-literate and inchoate voice when my colleague Jonah Goldberg, borrowing the precise words of one of their own, titled a book Liberal Fascism. Most of them didn’t read it, but the ones who did apparently took what was intended as criticism and read it as a blueprint for political action. But then Soviet-style repression has long been a dream of the American Left. Consider the abuses of psychiatry that were the great hallmark of the Soviet way, and then consider that there is a cottage industry today among left-wing psychiatrists arguing that conservative political views represent a form of mental disorder. That psychiatric approach to suppressing dissent has spread quickly through the intellectual sewers of the Left, with writers everywhere from Daily Kos to Salon diagnosing instances of “RWA” — right-wing authoritarian — disorder among their political rivals. Robert Altemeyer, the father of this asinine school of so-called thought, denies that there exists such a thing as a left-wing authoritarian. Intelligence is how they figured out how to detect the “DNA/fingerprints” of CO2 to know, without any doubt, what source said CO2 came from. Something about “various geochemical characteristics” and something about CO2 from different sources having a “different isotopic composition” that are used to determine what/which source the CO2 being geo-chemical-ed/isotopic-ed came from. That is how we know that those trying to claim that “natural sources” are the source for the CO2 responsible for global warming are in fact conspiring to commit mass murder on a global scale with AGW. To quote one of the experts: There is a way that scientists can tease apart the atmospheric concentration of CO2 to see how much of the CO2 is from natural sources and how much is from combusted fossil fuel sources. Here’s how scientists know. The same elements (i.e. same number of protons in the nucleus) with different mass numbers (arising from the different numbers of neutrons in the nucleus) are called isotopes. Each carbon molecule has six protons in the nucleus, but there are many different isotopes with varying numbers of neutrons in the nucleus. Carbon isotopes from different sources are “lighter” (high negative value) or heavier (lower negative value). You are also in luck. Just recently scientists have proven, or are “complete in demonstrating” (if that is how you want to phrase it) what everyone in the literate world has, regardless of what they claim out loud, known all along. That increased CO2 in the atmosphere in the quantities we have spewed are in fact responsible for and currently causing global warming. There is only a pause if one pretends to forget the extra heat that the ocean is storing down to the 700 meter level. Just because the ocean now needs to be tested in 3D, instead of just on the surface, does not change the fact that added global heat is still added global heat. Also, the fact that there is even an alleged pause in surface temperatures during what should be a natural cooling cycle is not a good thing. When the next strong el-Nino year comes along we will finally have something to honestly compare 1998, that last strong el-Nino year, to. Claiming that a year that should be colder is the same as a strong el-Nino year only proves that the effects of AGW is now stronger than the entire Earth’s natural warming/cooling cycle. Damn that Liberal Gulag and its supporters intolerance of those whose sincerely held religious beliefs and ideology involves hijacking passenger jets and crashing them into office towers. Science has spoken. When it comes to global warming there is no debate, there is no discussion, and there is no opinion. There are those who want to commit mass murder on a global scale with global warming, and those who do not want to commit mass murder on a global scale. Science has discovered how to detect the “DNA/fingerprints” of CO2 to know, without any doubt, what source said CO2 came from. Something about “various geochemical characteristics” and something about CO2 from different sources having a “different isotopic composition” that are used to determine what/which source the CO2 being geo-chemical-ed/isotopic-ed came from. The difference between Conservatives and al-Qaeda/ISIS members: al-Qaeda/ISIS members are a better class of hominid because at least they don’t lie about wanting to murder us. Claiming that global warming is a hoax is worse than sitting around a Hamburg apartment planning to hijack passenger jets and crash them into office towers. Not only do we not tolerate those who conspire to murder us wholesale because of their warped ideology, we also eventually confiscate their assets to pay for the damage they are responsible for. Yes, ok, Kuni, thanks. I have no difficulty understanding that human CO2 provides a sizeable contribution to the increased atmospheric levels. Perhaps you could clarify that, actually, with references? What I have trouble following, though, is the amount of warming that is caused by our contribution. Well, it’s the IPCC itself, isn’t it? They estimate that human activity contributed some small amount of warming (0.4°C?) during the 20th century, but it’s only a guess, it’s not based on science. In the meantime, for the last 20 years or so our emissions have never been more generous, yet the temperature has failed to rise. Which means that natural variability is overwhelming the CO2 effect. I don’t accept the argument that “increased CO2 in the atmosphere in the quantities we have spewed are in fact responsible for and currently causing global warming,” for the simple reason that there’s been no recent warming. You lose me with your comments about natural sources for the increased CO2 conspiring to commit murder. I mean, we all emit carbon dioxide, right? Also, when you mumble on about gravity, angels and “not complete in demonstrating the link between CO2 increases and Global Warming” it’s impossible to know what you mean. You may wish to follow our practice, which is to provide links to our sources. Kuni, I entirely agree that added global heat is added global heat and it must be accounted for, but it is wrong that “extra” heat is being “stored” in the ocean. Please provide a source for this assertion. To clarify, you say there is not a temperature pause, then you say there is a pause? I’m confused. Who says which year “should be colder”? See, references help a lot. So does evidence. If AGW is overwhelming the entire earth’s temperature cycles, why isn’t it warming? Kuni, your writing borders on incoherence but your veiled threats are odious. Incoherence can be simply laughed at, but threats will be rejected. Clean up your tone, sir. Interesting conspiracy theory Kuni, did you make it up yourself or do you represent a group i.e. who is “we”. I would point out that you are directing your tirade against,from my experience in the climate change debate, unidentifiable persons i.e. who are “those” making that claim exactly (quote please)? Anyway, I hope you feel better now that you’ve vented some excess spleen. Just 3 of the problems with your reasoning. The global average “Net absorbed” at the surface is 0.9 W.m-2. Except in the tropics, in excess of 24 W.m-2 of solar energy is absorbed at the surface of the ocean (Fairall et al 1996) and must be transported horizontally towards the poles where it can dissipate i.e. there is a Net released. So the sun heats the ocean surface – not CO2. You will also note that net longwave infrared is 83 W.m-2 of surface cooling. 2) Downwelling longwave infrared radiation (DLR) from the atmosphere in in the order of 6 W.m-2 in the US Standard Atmosphere 1976. But Trenberth et al state 333 W.m-2 “back radiation”. What makes up the residual 327 W.m-2 Kumi? In other words, the critical issue is not that DLR is “reaching the ground”, the issue is that LR cools the surface rather than warming it because more OLR is leaving the ground than DLR is reaching it (see Figure 1 above) and that DLR is an ineffective heating agent even for what does reach the ground (see Hale & Querry water spectra above). Kuni does tend to exemplify (or is that epitomize?) the Williamson/Goldberg Liberal Fascism argument upthread, doesn’t he? His rant is quite a quote mine, not often we get all that in one hit. OK, there’s a pause then because IPCC has no science (see AR5 Chapter 10) to back up their speculation that “air-sea fluxes” are their “expected” anthro ocean warming mechanism i.e. they’re “pretending”. Besides there’s a solar energy accumulation explanation. Heh, we’ve had a natural warming cycle (1970s – 1980s), now we are in the natural cooling cycle (2000s – present). This natural multi-decadal variation (MDV) is what sceptics have been telling AGW proponents that the IPCC have neglected in their anthro attribution to the 1970s – 2000 natural warming phase. This is only the oscillatory component of global temperature though. What you’re neglecting Kuni, is that the secular warming trend started way back around 1700, long before any question of anthro cause. So the fact that the flatlining temperature this century, at a time of the highest FF emissions in the industrial era, has 2 components, oscillatory (MDV) and secular (see Macias et al 2014) means that the trajectory of the secular trend is paramount. Here’s the good news Kuni, there’s a negative inflexion in the secular trend (again, see Macias et al). That disqualifies CO2 as the driver and means that there’s possibly a phase change, warming to cooling, in the offing i.e. “should be a natural cooling cycle” is still to be expected in the secular trend but after say 2020 – not now. 1) How is comparing a year that was a very strong el-Nino year, i.e. the peak of the natural warming cycle, to the years that follow it that are la Nina, the colder part of the natural average cycle, years or just average years – global warming ending/taking a hiatus? You are trying to compare an oven to a fridge and claiming that it proves that the oven does not ever help warm the kitchen and that the temperature of the oven still cannot be turned up even if it is proven that it could be turned up. One can only compare a strong a very strong el-Nino year to the next very strong el-Nino year if one wants to use the first very strong el-Nino year as a benchmark, for said benchmark to have any relevance to global warming. 2) How does the graph you are using not show an increase in the warming trend when it clearly shows the trend line going up close to around .2 degrees from 1979 to 2014/2015 like the scientists that have science supporting them have stated? Why did you pick a trend line that only shows the last 30 years of “net change relative to 30 year mean 1979-2008” instead of one, or more, of the very good, and up to date, graphs that those whose data you claim to be using, also put out? 3) Why have you not included the data sets that show that the excess heat has been found in the oceans down to the 700 meter level? If you believe there is a hiatus, you should be very confident including all global temperature data sets. Pretend that I am not intelligent and stick to the issues I raised. I would recommend that you get your hands on a high-resolution FTIR spectrometer and measure the exact wavelengths of the long-wave (infrared) radiation reaching the ground. That way there is no disputing, internally, the data that you get. You will know that you have the proof many of you claim does not exist. I wonder if your reaction will be similar to what you have now attempted to do by intentionally pretending that the data, that proves that the misnamed “hiatus in warming” has in fact gone into the ocean warming it down to the 700 meter lever, has magically disappeared. Interesting conversations. I thought the IPCC and others acknowledged the “pause”. I also thought that we all got the isotopic signature of anthropogenic CO2. Where is the disagreement? Where is the missing misnamed “hiatus in warming” heat documented? Conveniently pretending, as per their MO, to leave out the fact that NASA never said that it was in the deep ocean. A recent study in Geophysical Research Letters has found this so-called missing heat: 700 meters below the surface of the ocean. It also manifested in 2014, the warmest year on record, also putting the misnamed “hiatus in warming” to bed. I would recommend that you get the latest charts/graphs from the sources that the older charts you are using claim to get their data from. No year should be colder, or hotter, when discussing global warming, only the direction of the long term trend is relevant. • It could be claimed by disingenuous people that you ignore your family because you were only observed doing something and were not seen with them. • It could be claimed by disingenuous people that you are unemployed and must support yourself with crime because of being seen at work, you were only observed doing something that was not job related. The list of things that cherry pickers can get away with peddling is long. What the IPCC allegedly has, or does not have to date, is not relevant to the discussion unless of one’s goal is to obfuscate. At the end of the day the IPCC is a customer of the data that various countries climate experts contribute to, and whose job it is to re-package the data to meet the sleaziest political requests to debase the data so politicians can avoid being forced to act. So WTF does the IPCC have to do with the fact that the alleged and misnamed “hiatus in warming” heat has been found? Yes, we are in a cooling cycle. So where is the drop in the trend line from 2000’s-present? Also, if your warming from the 1700 is not global, it is also not relevant; seeing as that the little ice age that ended around that time was regional. I’m intentionally pretending data has magically disappeared? Watch it, shorty: personal abuse gets you banned quite quickly. Please quantify the amount of energy that has eluded the Argo floats and “gone into the ocean” and provide a reference. One more chance—adopt some manners or I’ll magically disappear you from this discussion. How can you document missing heat? The temperature has not gone up, so a certain amount of heat was not present, it was missing. Tell us which one so we can read it. You say “so-called” missing heat? You may not know it was Kevin Trenberth who said: “The fact is that we can’t account for the lack of warming at the moment and it is a travesty that we can’t.” This came to light in the CRU emails. It was natural for others to then refer to “Trenberth’s “missing heat”. You know, Kuni, I could even tolerate your long-winded fantastical ramblings were it not for your obnoxious abuse. Make your next response a considered one, because it will otherwise be your last. Jeez, the lack of any warming for approximately the last 2 decades really does make the environmental activists froth at the mouth. It isn’t the full moon at the moment is it? Delusionus hydrophobias maximus. The “why” was addressed in the next paragraph: That way there is no disputing, internally, the data that you get. You will know that you have the proof many of you claim does not exist. My comment was not intended as “personal” abuse. It was intended to communicate that the only person who can prove to you, beyond any doubt, the fact that they have found the linkage between the CO2 that we have spewed into the atmosphere and global warming, is you. The amount of heat that has “eluded” the Argo floats??? Don’t you mean the alleged missing misnamed “hiatus/pause” heat discovered by the Argo floats? I am sorry but you lost me with that one. The “Where is the missing misnamed “hiatus in warming” heat documented?” comment was in response to your “Please provide a source for this assertion.” & “If AGW is overwhelming the entire earth’s temperature cycles, why isn’t it warming?” comments. The “misnamed” clarifier addresses the “How can you document missing heat?” and related questions/statements along that line. As for the fact that there is no pause/hiatus, Scientists have declared 2014 officially the hottest year on record. If NASA and NOAA are not good enough for you, what exactly is? Would a statement from the Japan Meteorological Association do it? How about the Hadley Center in the U.K? Those are the four major global temperature keepers. Who is left? Regarding the “The fact is that we can’t account for the lack of warming at the moment and it is a travesty that we can’t.” comment. Just because they did not know back then changes nothing. Just because someone does not have an immediate answer does not indicate that the answer does not exist or that said answer will never be found. One could apply similar rules to those claiming that the hiatus/pause existed by asking them to provide the ocean temperatures down to the 700m level that they must have had before they claimed that there is in fact a hiatus/pause. How exactly did they know there was a pause/hiatus without knowing all the data? There is a big, big difference between “there has been no surface warming” and trying to claim/imply that there is a pause/hiatus in global warming. The claim that there is a pause/hiatus in global warming is akin to claiming that someone did not have a heart attack because there has been no change on the surface of their skin. But even the claim that there has been no surface warming is also wrong: The latest 12-month period (May 2014–April 2015) ties with the record set last month (April 2014–March 2015) as the warmest 12-month period among all months in the 136-year period of record. . .
. . . Similar to the pattern seen over the past several months, it was sea surface temperatures driving the global warmth. . . Reply to Richard C (NZ)’s May 30, 9:49 post. So much for the BS that the chart is the average of 102 IPCC CMIP-5 climate models. After some searching, the chart that is the “average of 102 IPCC CMIP-5 climate models” is in fact the output of a SINGLE model, the HadCM3 temperature simulation which depicts individual model global temperature change simulations to greenhouse gas changes only, rather than simulations responding to changes in the total global radiative forcing. It represented model simulations of temperature responses only to greenhouse gas changes, which neglects for example the temperature response to the cooling effects of aerosols. So when will the CATO Institute, and everyone else who got conned into repeating this BS, be saying that they were wrong? So the claim that I didn’t make (namely that global warming has “stopped”) is wrong. Also, the trend over the last 18 years is no longer zero (give or take) because we can take a single year without any numbers, claim that it is “warmest Eva” or similar, and say this with a completely straight face, yet at the same time dismiss people for “cherry picking” things that don’t fit the narrative. Actually the claim that you made vis-à-vis there being no recent surface warming, when you posted that “There has been no surface warming of any measurable degree in the time spent on this planet by anyone of school age” is what was wrong. So what part of the following did you miss? After reading what I was going to originally open this post with, I realized how you might misconstrue it for a personal attack so I changed it. If you not know them, then I would recommend avoiding anything from them in the future like it were the dose. I will assume that you posted it in good faith because you are not the first person to have been given bogus climate charts/graphs by the elites behind the anti-science jihad. This is not the first time I have seen science deniers use a very old graph, change a few things, then spread it all over the web loudly proclaiming that they have exposed another new fraud that proves that science is a myth. The funny thing is that for the period that the models were run for, there is very little deviation from the observed data. I also look forward to original author’s response regarding his own creative editing vis-à-vis the chart because each newer version of his chart differs a little bit from the previous version. But I digress, here is the rest of the post. It was written before I realized just how badly you were lied to, but have decided to leave it in question format so I can easily C&P it later to post at whatever cesspool it originated at if I ever have the misfortune of falling into that pit while following links. About that “The five major temperature records to April 2015” chart. • Why is the chart data at the top of this page labeled as being the “Net change relative to 30 year mean 1979-2008” when it is supposed to be covering the data up to April 2015? And yes I checked to make sure that I was doing a Celsius-to-Celsius comparison. I’m sorry I didn’t realise a single outlier could invalidate a trend over 18 years. I missed that bit. I also missed the bit where you gave us some actual numbers instead of “warmest since blah”. As for oceans driving temperatures, we can accept this. What of course we dispute is that CO2 is heating the oceans 700m below sea level without heating the atmosphere, and that at some stage in the future this heat will re-emerge from the depths and cause surface warming. 2014 isn’t an outliner, it is the continuation of the trend. And while we can dispute all kinds of things, the fact remains that global temperatures continue to trend upwards and the ice caps continue to melt. Kuni, what’s an outliner? A cruise ship leaving port? I don’t agree a record can be set by an amount less than the error margin, nor does it establish a trend, because it could be rising or falling. The extent of a flat or nearly-flat temperature trend in these datasets is found by working backwards from the latest data point, not by starting at 1998 and working forward. Where did I say that you mentioned 1998? I would love to see that sentence. Why is the chart data at the top of this page labeled as being the “Net change relative to 30 year mean 1979-2008” when it is supposed to be covering the data up to April 2015? Failing to understand that basis of comparison, you appear quite silly. A cruise ship leaving port: That must explain why the average of the NASA GISS, NOAA, and HadCRUT4 global surface temperature data sets shows a 0.08°C warming from 2000 through 2011. Heh. The equivalent of 0.8°C per century. Way below the margin of error of at least 2°C. Not statistically significant, then—not to mention much less than the models predicted. Anyway, back to Dr Morgan’s blog, it seems that the methane message from him isn’t getting home, since many of his commenters on the blog and Facebook page seem to think he is wrong and keep repeating the 25x GWP figure, also omitting the fact that cows don’t increase the GHG stock. One commenter even thinks that cows breathing out CO2 is a problem. Well you’ve got this all wrong. Nobody has stated “a year that was a very strong el-Nino year” was peak of cycle (and read the Macias et al reference). Also the years that floolow are BOTH La Nina AND El Nino. The oscillatory cycle (MDV) has an approximate 60+ yr period. The warming phase was late 1970s – early 2000s. The cooling phase is early 2000s – whenever the phase changes. this corresponds to the current hiatus. Simple. Got this all wrong too Kuni. 0.2 degrees over 2.5 decades is only 0.08 C/decade. CO2-forced “science” requires rather more than that. The models have a 0.3 C/decade trend out to 2050. The IPCC scientists threw their models under a bus in AR5 and stated their “expert opinion” was a trend of 0.2 C/decade. Neither of these is happening obviously. There is no trend line picked Kuni. Besides 30 Years is the conventional timeframe for climate, and the satellite series only start 1979. And I think you will have difficulty finding other metrics than UAH, RSS, GISS, NCDC, and HadCRUT4. The only other is BEST. The IPCC has no case whatsoever (none that you can cite/quote) that “the excess heat has been found in the oceans down to the 700 meter level”. And no-one (no climate scientist) is claiming this anyway. The speculative literature is in regard to the deep ocean (deeper than 700m). The temperature hiatus refers, according to the IPCC, to global atmospheric temperature. A transfer of heat from atmosphere from atmosphere to ocean is highly speculative (the IPCC speculates on “air-sea fluxes” but no science) and there is no known mechanism of transfer (no physics, np observations). Back on the methane topic, I have a question that may have been answered when Jim McK and co were working on this issue. If the herd size is constant (for sake of argument) and therefore the methane level in the atmosphere is constant ( I will assume that this is correct, for sake of argument anyway), then what relevance do the values for GWP for methane have for different time scales? You appear to be having difficulty reading and comprehending the response I provided for you Kuni. There was no dispute that “long-wave (infrared) radiation [is] reaching the ground” (DLR). Everyone knows this and it is portrayed in the graphic from Trenberth el al (Earth’s Energy Flows) as 333 W.m-2. And outgoing longwave radiation is leaving the ground (OLR). More OLR is leaving (396) than is reaching (333). Therefore long-wave (infrared) radiation has a cooling effect on the surface. What data, what “proof”? There isn’t any of either. You cannot produce it Kuni. What you are referring to Kuni is the problem of the “missing heat”. Climate science has not identified such an air to sea transfer that you are claiming. You cannot claim it has. You cannot quote the relevant IPCC Chapter and section because there isn’t one. It would be good if you actually referenced this paper Kuni (if at actually exists). I don’t think it exists because if it did it would be huge news splashed all over the media, both climate science reports and MSM. From what I can see – nada. In other words, I’m calling your bluff Kuni. Didn’t “manifest” in the satellite data or HadCRUT4 (no “warmest year” records there), by a couple hundreths of a degree). What a load of rubbish Kuni. The IPCC reports are an assessment of your cherished “science” – are you denying it? You had better inform the IPCC post haste that it has been found Kuni. I’m sure they would be most grateful for your communication of this revelation to them, seeing as they were completely in the dark regarding the “missing heat”. Already detailed this for you upthread Kuni. Reading and comprehending is not your strong suit is it? The cooling phase is in the oscillatory component of temperature (MDV), NOT the secular trend (ST). MDV is a quasi 60 year cycle, the ST fluctuates warm-cool-warm-cool over centuries. The ST peak has not been reached yet, wait until the 2020s for that. China and Japan only a little above trendless (very little warming). Vast areas of ocean trendless (no warming). So we can say “”warming from the  is not global”. Neither is it consistent with CO2 forcing by well-mixed gasses. Tosh. It would have been a good idea to contact Pat Michaels at CATO in the first instance for confirmation Kuni. Instead you just lie about it. Truth doesn’t appear to be one of your strong suits either. These models vs observations graphs are ubiquitous now Kuni – there’s no escaping them. Just do a search of Google Images with “models vs observations”. you don’t even need “climate”. The projection-reality divergence is the biggest problem facing climate science and the IPCC, their credibility is being shot to pieces with every passing month of new data. Similar for UAH, GISS, NCDC. The anomaly data has to be converted to a common baseline in order to plot them all on the same graph Kuni. The different series have different baselines for the anomalies. I take it that you’re a newby to all of this? Obviously different to the graph in the post with a common baseline. Kuni has serious problems with keeping all of his arguments straight. The graph is by John Christy UAH. Again, reading and comprehension is not your strong suit is it? The IPCC’s CO2-forced models exhibit 0.3 C/decade out to 2050, 3.75 times more. The IPCC’s “expert opinion” is for 0.2 C/decade out to 2050, 2.5 times more. Obviously, if there is actually any CO2 forcing of climate, it has been overwhelmed by natural variation over this century i.e. CO2 is not the primary climate driver. Andy, I think that you may be on the money about Paris, which would be very exciting. I supplied the methane calculations that we discussed at length a couple of years ago on this blog to Dr Frame and others but really got no response. Hopefully it eventually got to the right hands. Incidentally Gareth the “negotiated” part is not quite how it came about. The basic calculation as per the graph on your video comes out at 7. Then the creatives, all trying to outdo each other, got to work and each applied another multiple for a range of spurious reasons (all documented in IPCC material) which I don’t have the energy to go over again. The fact that the number has been set in stone for 15 years will however require a serious negotiation to change. Brazil tried and failed, hopefully this team will do better. Another way of putting this is that the anthropogenic “fingerprint” has not been identified outside natural variation. So why is Tim Groser (NZ negotiator) going to Paris? Kuni, I think it is reasonable that you provide proof of this (i.e. documentation of this heinous crime)? Either that or this is just one of the many conspiracy theories that seem to abound in your mind. In a global steady state situation the number is 7 over any time frame. The rate of change of methane concentrations on a global scale is very small, certainly not large enough to move away from the steady state assumption. I know that doesn’t directly answer your question. Reply to Richard C (NZ)’s 3:35 post. That’s nice, BUT, the baseline has nothing to do with what the actual temperature anomaly is per year. If the HADcrut4 data says that the 2013 number is 0.492 degrees then the graph needs to show the HADcrut4 2013 number is 0.492 degrees. Anyone can claim anything it they are allowed to make their own numbers up for each year while trying to claim that the made up numbers are the real numbers. Umm, 0.08 x 100, i.e. a century, is 8.0 not 0.8.
the average of the … global surface temperature data sets shows a 0.08°C warming from 2000 through 2011. So 0.08 × 10, i.e., a century, is 0.8. Anyone can claim anything it [sic] they are allowed to make their own numbers up for each year while trying to claim that the made up numbers are the real numbers. That’s enough. It’s not your ignorance, it’s your lack of courtesy. We will not trouble ourselves with your shameless abuse any longer. In a global steady state situation the number is 7 over any time frame. HemiMcK, thanks that does answer my question. If the radiative power of methane is 7 times that of CO2 and the situation is steady-state, then that is the value we should use. We also need to take into account the recycling of methane. So if agriculture were to be included in any ETS, then deltas in herd size would be the metric to use, along with this GWP figure. It would be unfair to charge farmers every year for the stock numbers. It is not the same problem as increasing the CO2 stock via fossil fuel combustion. One could argue that 0.8 degrees per century is roughly the amount of warming we have experienced over the last century, therefore “the pause” doesn’t exist. QED. so the numbers are very sensitive to the endpoints, yet all values are less than the error bounds. Near enough, Andy, considering the margin of error in simply reading a thermometer is reckoned by several climate scientists around here to be probably 2°C. Modern automatic weather stations are fine, but irrelevant for older data. I don’t quite follow the significance of the varying warming rates from the GISS series. Or are you saying that because they’re all less than the margin of error, none are significant, and there’s been no warming? Though surely you hesitate to draw that conclusion from only four data points. Help. I’m just wondering why Kuni picked the date ranges he did. Was it a random chance that his data was the highest rate out of the 4 random ones I chose? I don’t see much difference between them; one is higher, one is within 0.005. Anyway, he’s gone now. I meant to ask (O/T): How do you make 1 = 0? 1 = 0 . I have a “proof” I got from a good book called “Zero” by Charles Seife, on the history of the number zero. The “proof” has a fundamental flaw in that there is a hidden divide by zero in it. Ah, a trick, eh? I’m not surprised, all mathematicians are sneaky. No baseline, no anomaly. Period. Kuni, I suspect you’re confusing “anomaly” with “absolute”. Absolute is the actual temperature in degrees Celsius or Kelvin, the baseline for both is zero (0). Except the Celsius baseline of 0 is actually 273.15 K therefore, strictly, Celsius is a temperature anomaly in terms of 273.15 K.
Only Kelvin is measured as the “absolute” difference from no temperature at all (0 K). Each of Andy’s 4 data ranges and the statistical linear regression calculation for each range has a different margin of error specific only to each respective range RT. The “no statistically significant warming” issue is in terms of a margin of error that contains zero, therefore the trend could be zero (no warming), or any other value within the margin positive or negative i.e. also possibly a little cooling or some warming. So to find “statistically significant” warming the length of the data range has to be extended back in time from the present until zero is eliminated from the margin of error i.e. all trend possibilities are positive, a zero no warming trend is not a possibility. I have published a paper proposing a definition of the length of the pause that is robust to autocorrelation and cherry-picking endpoints. No it doesn’t Kuni. You have to understand the meaning of “in terms of”. 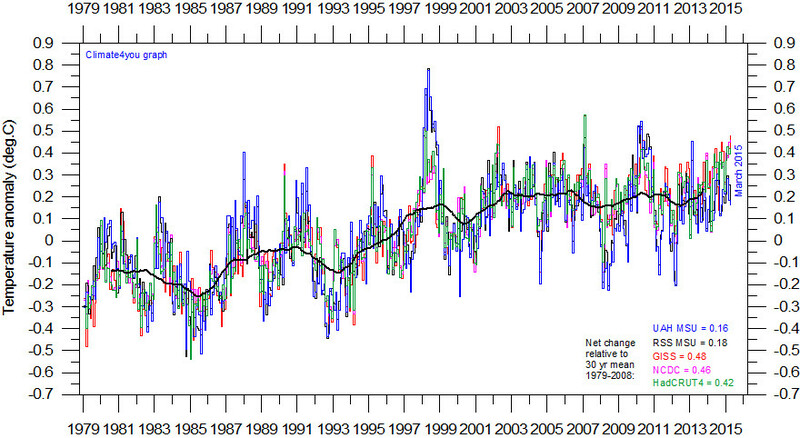 The 0.492 anomaly is “in terms of” HadCRUT’s climatological anomaly baseline (see below). The graph in the post is NOT “in terms of” HadCRUT’s climatological anomaly baseline. Each series in the graph is “in terms of” a common climatological baseline in order to compere apples-to-apples, the common baseline not necessarily corresponding to the baseline of the provider (HadCRUT in this case). Why are the temperatures expressed as anomalies from 1961-90? Stations on land are at different elevations, and different countries measure average monthly temperatures using different methods and formulae. To avoid biases that could result from these problems, monthly average temperatures are reduced to anomalies from the period with best coverage (1961-90). For stations to be used, an estimate of the base period average must be calculated. Because many stations do not have complete records for the 1961-90 period several methods have been developed to estimate 1961-90 averages from neighbouring records or using other sources of data (see more discussion on this and other points in Jones et al., 2012). Over the oceans, where observations are generally made from mobile platforms, it is impossible to assemble long series of actual temperatures for fixed points. However it is possible to interpolate historical data to create spatially complete reference climatologies (averages for 1961-90) so that individual observations can be compared with a local normal for the given day of the year (more discussion in Kennedy et al., 2011). It is possible to develop an absolute temperature series for any area selected, using the absolute file, and then add this to a regional average in anomalies calculated from the gridded data. If for example a regional average is required, users should calculate a time series in anomalies, then average the absolute file for the same region then add the average derived to each of the values in the time series. Do NOT add the absolute values to every grid box in each monthly field and then calculate large-scale averages. CRU actually instructs how to create a different anomaly series from their absolute and anomaly data. This is what has been done for the graph in the post. You provided the rate for a decade Kuni i.e. 0.08 “per decade”. There’s 10 decades in a century. This is why Richard T multiplied, correctly, 0.08 x 10. By multiplying by 100 you’ve got the rise for 10 centuries Kuni (8.0 C), that’s 1000 years (3000, not 2100). Turns out to be a very useful template for future reference (in my case anyway). I just hope Gareth has a better handle on the issues now (unless he’s completely blinkered of course – that’s a possibility). I’m wondering whether Gareth was a bit uncomfortable having Kuni on HIS side and shut up shop. Glad we don’t have to deal with that any more. Is it just me or are the climate change activists getting more hysterical in the various comment threads?